NEWPORT, Ky. -- It took Jim Price nearly three decades to get his dream house. Even then, it took hard work to make the dream a reality, including tracking down the home's stained-glass windows through four dealers to bring them back to their original places. 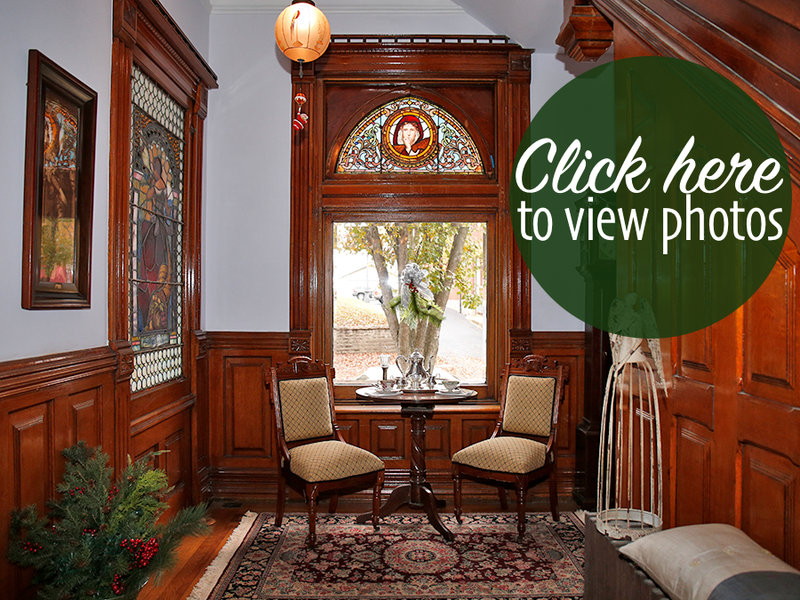 The home is one of seven (plus three "points of interest") you can visit during the East Row Victorian Christmas Tour Saturday and Sunday. The tour, which lets attendees peek inside homes in Newport's East Row Historic District while they're all decked out for the holidays, is in its 24th year. Price's Queen Anne Victorian dates to 1889. It was built for Thomas McIlvain, partner in the McIlvain & Spiegel Boiler & Tank Co. of Cincinnati. Price saw the home for the first time nearly 100 years later. Even back then, when he was still in college, he knew he wanted it. "Something about it called out to me," the general contractor and project manager said. "It needed work. I'm a craftsperson, and I really wanted to fix it." He kept in touch with the homeowners, even during the 20-odd years he lived in California. The owners contacted him and said they were ready to sell in 2015. "It took me 28 years to get it," he said. The house had withered in the meantime. Price described returning to discover walls and roof pockmarked with holes, windows decorated with ragged lace, missing bricks and brackets on the striking turret, leaning columns and a Dutch gable ready to buckle into the street. In some places, paint had been worn down to bare wood. And there were the missing windows. Of the home's 11 stained-glass windows, the four Price considers the best were gone. "I tracked them through four dealers to Portland, Oregon," he said. "I actually bought them before I bought the house. "It didn't even cross my mind that I wasn't going to do it," he added. That was just the beginning of the work, though. The signs of neglect Price mentioned are long gone, and the roof no longer leaks when it rains. A visitor would also never guess the home's third floor was closed off, had holes to the outside and had suffered heavy damage. Today, that space includes a beautiful, light-filled guest "apartment" and a large studio where Price makes ribbon-winning quilts. At one time, the entire house was broken into apartments. Price said it became a boardinghouse as early as 1914 and was later divided into seven apartments. Although it was converted back to a single-family home in the late 1970s, Price still had to work to get it back to its original state. That included replacing some of the ornate moldings and banister sections that had been lost when it was divided. Luckily, however, most of the home was still intact. "In spite of it being cut into apartments, it wasn't damaged," he said. "It's probably 97 percent, 98 percent original and still here." That's fortunate considering what is there. "It's a very interesting house," he said. "The level of detail that they went to is incredible." Beyond the intricate, sunburst-patterned moldings and stained glass, there are seven fireplaces with Kensington tiles made in Newport and detailed brass hinges and hardware on the doors. Different woods adorn opposite sides of the pocket doors to coordinate with the rooms they divide. Price figured out why some of those doors were stuck -- their keyholes were full of decades-old mercury dimes and century-old Indian head pennies, which he imagines children dropped inside long ago. Another remarkable discovery was missing stained-glass mosaic for the home's facade. Price was shocked to find it pinned up under the studs inside the roof, where it had apparently been since the house was built in 1889. "It was just staged there, just waiting," he said. "I almost went over the scaffolding backwards." Throughout the home are Price's many pieces of Rookwood Pottery. He bought the first one off the hood of a car at a flea market when he was 16. Though he's done a lot in the brief time he's owned the home, Price still has more that he wants to do. He has drawings ready for his next big project: Renovating the kitchen. It won't be an easy task, considering the room has six doors and two windows to factor into the design. Price realizes now that much of his desire to buy the home stemmed from his desire to restore it to its former glory, but living there has its perks, too. "It's a big house and it's stately, but it's also very comfortable," he said. "You can come in and put your feet up and relax." Tickets: $16 in advance; $18 day of tour. Children under 12 are free with an adult.